I recently had the distinct pleasure to interview one of my favorite authors, Wil McCarthy. Upon completing three of his latest books - two sci-fi and one work of non-fiction - I realized that many of our readers would probably enjoy his ponderings as much as I. The questions for this interview stem from my own interest in programmable matter, and the awe-inspiring possibilities raised by Wil in his book HACKING MATTER. The side-bar contains a few quotes from HM. Can you give our readers a brief explanation of "artificial atoms" and "quantum dots," and how they - when produced en mass - can create "programmable matter"? A quantum dot is a device which traps electrons in a very small region of space, forcing them to behave like tiny standing waves, just as they do in atoms. An "artificial atom" is a cloud of electrons trapped in this way. Although it has no nucleus of its own, the artificial atom behaves in many ways like a real atom does. Producing large numbers of artificial atoms inside a bulk material, such as a semiconductor, will alter its properties dramatically so that, for example, it can be made to appear and behave like a metal, or an insulator. The material's color, transparency, reflectance, thermal and magnetic properties can also be altered, in real time. How do the quantum dots that you write about differ from the nanocrystals with the same name, which are being used as "optical beacons"? "Quantum dot" is a word like "switch," which describes a lot of different devices which look very different but fundamentally do the same thing. These semiconductor nanocrystals are a good way of trapping electrons, because chemists can grow them very precisely. In a solution you may have moles(1) of this stuff, really enormous numbers of particles, which are almost exactly the same size and shape. People like them for their optical properties: they drink in white light and emit a single bright color. They're finding uses in biology to replace fluorescent dyes, and as optical elements of lasers and such. It may be possible to create very, very tiny lasers which could, for example, perform surgery inside a living cell. But that's only one type of quantum dot. You can also trap huge numbers of electrons on the surface of a metallic particle, where their properties will be rather different. Fullerenes and nanotubes also hold great promise, but my favorite sort of quantum dot uses electric fields to confine the electrons in a layered semiconductor called a quantum well. This is a neat trick, because by adjusting the voltage on a set of metal electrodes you can precisely control the number of electrons trapped in the dot, which is equivalent to changing the atomic number of the artificial atom. This is where the term "programmable" comes in, because it's quite feasible to control these properties with fairly simple microelectronics, to produce atoms and materials which could not exist in nature. How does your definition of "programmable matter" differ from that used by a cellular automatist? A cellular automaton is a type of computer program which models a region of programmable "cells" whose behavior is dependent on the states of neighboring cells. This can be really useful for simulating phenomena like fluid mechanics, and one advantage it has over real-world testing is that the properties of a given cell -- its virtual "substance" -- can be changed at a whim. The term "programmable matter" is sometimes used to describe these simulations, but of course this "matter" is symbolic and has no existence outside of a computer screen. It's virtual programmable matter. However, programmable solids based on electrostatic quantum dots are possible, and to a very limited extent they exist right now, in laboratories all over the world. This is not a virtual or theoretical exercise -- the material properties of the solid really do change. Do you foresee an integration of quantum dot technology with molecular manufacturing, aka nanotechnology or molecular nanotechnology (MNT)? Or are they too far divergent? To exhibit atom-like behavior at room temperature, quantum dots need to confine electrons in a region of 20 nanometers or less, so any useful programmable material would really need to be assembled with nanometer precision or better. So you do need some very sophisticated manufacturing techniques, and MNT is a good candidate, along with "atom optics" which can beam atoms onto a surface en masse, with incredible precision. Programmable matter exists in the solid state, with no moving parts except electrons and photons, whereas MNT is all about tiny machinery, so yes, they're very different technologies which just happen to exist on the same scale. But they could be very complementary. Nanomachines which incorporate programmable atoms might be among the most powerful and versatile devices we could ever create. Integration with microtechnology, including J. Storrs Hall's "utility fog," is another strong possibility. In your opinion, why has there been so little press coverage of quantum dots, aside from the medical (optical beacon) applications? Good question! The implications of this field are enormous, and fairly obvious to anyone who sits through even a cursory explanation, but almost no one in the press is paying attention. A few science fiction writers are following my lead today, moving in to explore this technology in tentative ways, but the real-world stories are published mainly in very technical journals, not glossy magazines or newspapers. WIRED has been fairly progressive in this area, and IEEE Spectrum has recently picked up the torch and seems to be running with it. But for Newsweek and Time it might take a while. Can you give our readers a brief explanation of "wellstone"? Well, I'm an engineer as well as a writer, and when I first started hearing about quantum dots it struck me right away that programmable matter was the ultimate application. So my busniess partner and I started brainstorming, and we came up with a method for controlling quantum dots inside a bulk solid. Basically, you put the quantum dots on the surfaces of very small fibers, and then weave the fibers together. That's wellstone, so called because it's made of quantum wells and silicon, or stone. We filed a patent on the idea and have already turned away two venture capitalists, because their money and time horizons were too small. But our company, Galileo Systems, is already doing aerospace research for the U.S. government, and we're working our way toward research dollars in this area as well. The main obstacle is the sheer amazingness of our claims; no matter how carefully we phrase things, you can see these bureaucrats' jaws drop, or their arms cross in disbelief. But little by little we're getting there, as information becomes more widely available, less shockingly novel. What are some of the remaining significant technical hurdles that must be addressed prior to the creation of wellstone? The greatest bottleneck is in manufacturing -- the tolerances are just not achievable in three dimensions right now -- but there are theoretical issues that need to be ironed out as well. Between the realm of cells and atoms, nobody fully understands how materials behave. There are lots of surprises in store, and our designs will undoubtedly need to be tweaked along the way. But with determination, we can probably build something close to a wellstone fiber within 10 years. Since the publication of your book HACKING MATTER have you heard of any research that indicates that your speculations are still on track? The worst thing anyone has said about HACKING MATTER is that some of its speculations can't be proven at this time. Which is true. This is a hallmark of any new field, including nanotechnology. But programmable matter's underlying principles are on very solid footing, and the physicists profiled in the book have weighed in their cautious support. Some applications have yet to be demonstrated in the lab, but there's nothing obviously wrong with them. What inspired you to write the science fiction novels THE WELLSTONE and THE COLLAPSIUM, and the novella ONCE UPON A MATTER CRUSHED? Do you have to ask? With this sort of cool future technology at hand, completely unxplored by the field of science fiction? I saw my chance to do something really new and inventive, and jumped at it. It was only later that I began pursuing it seriously as a scientific endeavor, and even that was mainly out of frustration. If someone else had moved forward with the idea, I'd've probably been content to watch from the sidelnes. Technological hurdles aside, when/if science reaches the point where wellstone (or some equivalent) is practical and inexpensive to manufacture, what do you see as some of the "life style" implications? Read HACKING MATTER, or my science fiction books on the subject. The implications touch on nearly every aspect of our lives, from clothing to transportation to vehicles to housing, and are just too huge to address in a space like this. The programmable house, with its heat pumps and solar collectors, its anywhere stovetops and moving, shape-changing windows, takes up a whole chapter all by itself, and barely scratches the surface. Where would you like to be in 2020, and what would you like to be doing? Where would I like to be? Looking out at the rings of Saturn from my private space yacht, sipping bourbon from a squeeze bulb and playing footsie with my wife. I'll be 54 at the time, though, which may be too young for retirement, especially if some of these anti-aging therapies start working out. So maybe we'll push that one off to 2030. "A thin disc of wellstone inside the eye - or a contact lens on the eye's surface - could photodarken to protect the retina against bright lights (even extremely sudden ones). It could also act as a permanent "head-up display," projecting pre-lensed holographic information onto the retina. Piezoelectric wellstone in the ear could serve as both a receiver and a generator of sound waves." "This point bears repeating: the electrons trapped in a quantum dot will arrange themselves as though they were part of an atom, even though there's no atomic nucleus for them to surround. Which atom they resemble depends on the number of excess electrons trapped inside the dot. Amazing, right? If you're not amazed, go back and read the last four paragraphs again. I'll wait." "A wellstone TV might look less like a moving picture and more like a window into a real, three-dimensional space. You could paste these all over the inside of your house, making it look (from the inside) as though you were living in Tahiti, or Antarctica, or on the red-hot surface of the planet Mercury." "If transparent wellstone were able to take on a very low index of refraction, its optical characteristics would resemble those of air or vacuum. This is true invisibility, and it could result in aircraft that did not show up on any electromagnetic scanners of any kind, including the human eye." "If programmable matter can be made to work, not only is it a powerful technology in is own right, providing hypercomputers and dazzling optics and an unimaginable wealth of new materials - it also has an "instant gratification" quality that eliminates many of the inconveniences of today's world. New materials can be invented and examined at any time, without the need to mine or manufacture or calculate anything. New devices can simply be specified and tried - eliminating the pesky steps of design iteration, parts and materials acquisition, prototyping and production. Matter becomes something akin to software - infinitely malleable and precisely obedient. In the future, manufacturing may join mathematics and software as an enterprise where true, literal perfection is not only possible but easy and quick. This makes the technology of programmable matter a huge enabler and catalyst for technology development in other areas." "Undoubtedly, there are hard physical limits on what human beings can accomplish through the tweaking of matter's building blocks. But I, for one, find it exciting and reassuring that we're nowhere near these limits. In fact, we can't even guess where they are. Until we hear differently, the major restriction is our own feeble imagination." "(But) with programmable matter at our command, we may find it trivial to construct much lighter and more capable spacecraft, even as we wallow in an energy glut of unprecedented proportion. Effectively, we'd all be multibillionaires, with the economic and industrial clout of entire twentieth-century nations at our command." "If programmable matter is indeed a practical goal, there is scarcely a field of human endeavor that won't benefit in some way." 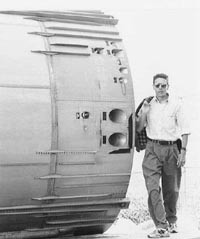 An occasional aerospace engineer, SF writer Wil McCarthy is currently a contributing editor for Wired magazine and the science columnist for the SciFi channel. His novels include the New York Times Notable BLOOM, Nebula Nominee THE COLLAPSIUM, and most recently, THE WELLSTONE. His nonfiction book, HACKING MATTER, concerns the emerging science of programmable materials, and was a #4 bestseller on Amazon.com and a selection of the Library of Science Book Club, the Science Fiction Book Club, and How To Media (aka Science News Books). 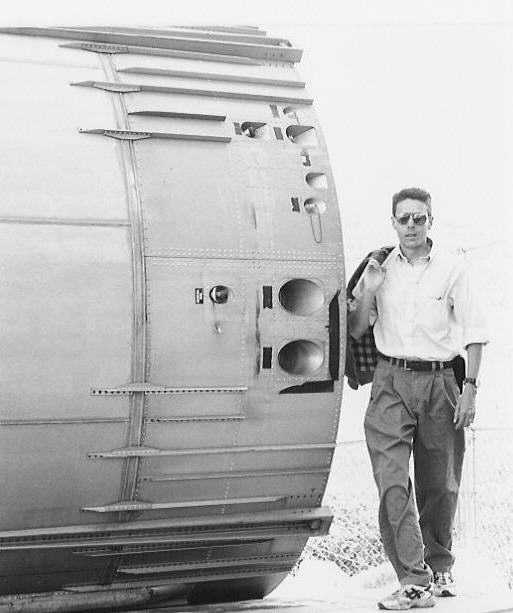 Wil McCarthy standing next to a Titan II Stage 2 rocket body. Click to enlarge. Click on the image of the book or the title to see reviews, or to buy.